One would not naturally believe the cloudy Netherlands to be a good source for world class astronomers, but in fact astronomers from that tiny country have played a crucial role in the exploration of the Milky Way. In part this is because the universities of Groningen and Leiden have been the alma mater for many of the 20th century's leading astronomers, who moved after graduation to direct astronomy programs around the world. And in part, this is because of a 25 meter radio dish sitting near the Dutch village of Dwingeloo, in a swampy national park. The Dwingeloo radio observatory was completed in 1956. Its first major project was a survey of major galactic radio sources carried out by Gart Westerhout in September 1956. Westerhout's radio catalog identified many of the largest star formation regions in the galaxy (at least those visible from the northern hemisphere), and their Westerhout numbers (such as W51) are still in use today. The Dwingeloo observatory was able to pierce through not only the cloudy Dutch skies, but the far larger giant dust clouds that obscure much of the galaxy from the view of optical telescopes. As a result, Westerhout discovered a number of major HII regions, star formation regions and supernova remnants that do not appear in the Sharpless, Gum and RCW nebula catalogs. In addition, he discovered star formation and other strongly radio wave generating areas of nebulae that do appear in these catalogs. There are 82 entries in the Westerhout catalog. Three don't really count. W2 was an attempt to detect the Andromeda galaxy and W19 was an attempt to detect the Coma-Virgo galaxy supercluster. Neither attempt was successful. 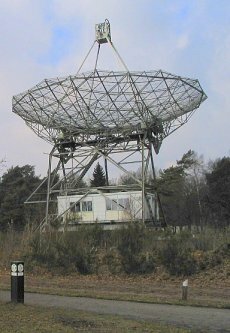 W82 was an observation of the moon, presumably to test out the radio dish. So there are really 79 objects in the catalog. At least 16 Westerhout radio sources are associated with significant Milky Way HII and star formation regions that do not appear in the Sharpless, Gum or RCW catalogs. W31 This massive HII and star formation region includes the supernova remnant SNR 010.2-00.3 and is located in the inner galaxy at a distance of about 3400 parsecs. W33 This is a massive star formation region in the inner galaxy in the same direction as Sh 2-40, but at the much greater distance of 4000 parsecs. Includes the supernova remnant SNR 012.8-00.2. W39 Also called "Radio source GRS 018.88 -00.48" in the Simbad database, W39 is very visible at radio and infrared frequencies and faintly visible as a circular nebula in hydrogen-alpha images. It is a major HII region although very little has been published on it. W43 This massive star formation region includes the supernova remnant SNR 030.8-00.2, and a giant HII region at 6200 pc visible in the infrared. W47 This is an HII region located at a distance of 11000 to 12000 pc. W49 The W49 giant molecular cloud and massive star formation region includes the giant HII region W49A and the supernova remnant W49B. The entire complex lies at a distance of 11400 +/- 1200 pc. W51 W51 is a giant molecular cloud and massive star formation region that includes a giant HII region, several smaller HII regions and masers, and a supernova remnant (SNR 049.2-00.5). W52 W52 is part of the HII ring GRS 053.90 +00.30 (erroneously called a supernova remnant in Simbad), which is in a similar direction to Sh 2-82, but much further away at a distance of about 3200 parsecs. W54 Westerhout noted "Size and position of this maximum are very uncertain". Bica and colleagues identify W54 with the mysterious nebula NGC 6813 and the infrared source IRAS 19383+2711. They find that it contains the infrared cluster [BDS2003] 14. Avedisova also lists IRAS 19383+2711 as a star formation region. W61 Avedisova says that W61 is part of the same star formation region as the HII region DWB 111, popularly known as the Propeller nebula. Both are located towards the northern edge of the Cygnus X complex. W68 Avedisova identifies W68A with the star formation region DR 6. W69 This HII region in Cygnus is also called DR 13 and GAL 077.96-00.01, according to Simbad, or DR 9, according to Avedisova. W70 This is DR 16, a major HII and star formation region in Cygnus located at a distance of 3000 pc. W72 W72 is the star formation region DR 17 in Cygnus. W73 Avedisova identifies W73 with the HII region DR 18. W75 W75 (W75 S more precisely) or DR 21 is an HII region in Cygnus. W24 is the centre of the Milky Way. W3 W3, W4 and W5 are associated with the Heart and Soul nebulae in the outer galaxy. In particular, W3 is the bright part (IC 1795) of the Heart nebula (Sh 2-190). W42 Also called "GRS 024.80 +00.10" in the Simbad catalog, W42 has wildly varying distance estimates. However, a recent paper published in 2000 suggests a near estimate of 2200 parsecs, which would make it identical to Sh 2-60. W58 Associated with Sh 2-99 and Sh 2-100 as well as maser CTB 82. W58A is a giant HII region. W62 Westerhout identifies this with IC 1318a, which is part of IC 1318, the Gamma Cygni nebula = Sh 2-108. See this very useful page on IC 1318 for the different parts of this nebula. W67 Westerhout identifies this with IC 1318b, which is part of IC 1318, the Gamma Cygni nebula = Sh 2-108. See this very useful page on IC 1318 for the different parts of this nebula. 7 unidentified radio sources are located in or near the crowded and heavily visually obscured Cygnus X complex. Because of the many intense sources of radiation in this area and the difficulty of establishing distance estimates in such a crowded and obscured region, it is perhaps not surprising that these sources have not been clearly identified. These are: W59, W64, W65, W74, W76, W77, and W79. Westerhout himself expressed doubt about four of the remaining unidentified sources. For W11 and W15 his notes say "probably 0-line error" and for W27 and W53 his notes say "possibly 0-line error". As well, the note for W26 says "Clearly the base of the "flare" at right-angles to the galactic plane". I'm not sure what this comment means but it appears to rule out associating W26 with a real galactic radio source. This leaves only two mysterious radio sources outside of Cygnus X. These are W45 and W46. Westerhout tentatively identified the source W45 with Sh 1-58 = Sh 2-76 but noted "Identif. probably incorrect". SIMBAD identifies W46 with the infrared source IRAS 18549+0913.